I refuse to burn my socks. It’s a quiet refusal. I’m not trying to mess up anyone’s rites of spring or to rally support for an anti-sock-burning movement. It seems to me that my quiet rebellion, exercising my right to just be me, is in the spirit of the season. 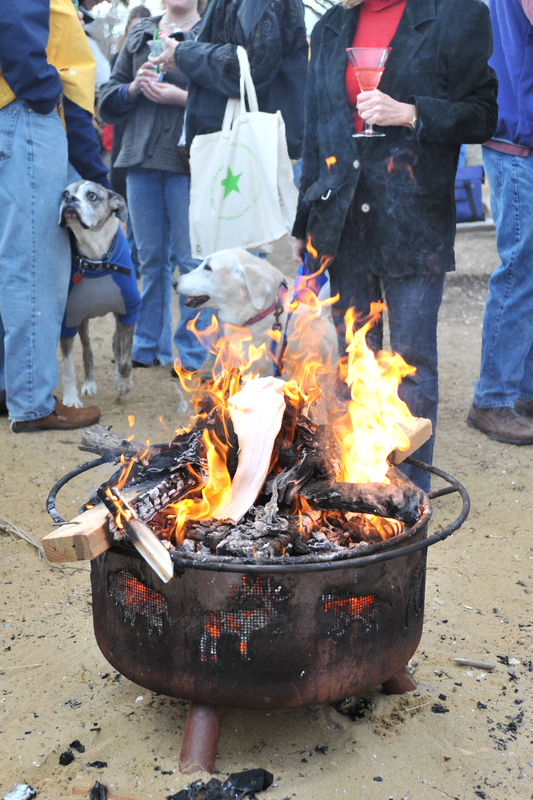 I’m not the only sailor in Annapolis who will attend a sock-burning gathering for the vernal equinox and walk away still wearing socks. I’ve seen a few shamelessly sock-clad friends participate by pulling old socks out of a pocket and dropping them into the bonfire. As if removing and torching one’s footwear as a seasonal ritual isn’t quirky enough, imagine what the outside world would make of such cheating. As well as a fondness for the occasion, the sock-in-pocket crowd and I share a preference for warm feet on damp, chilly March days. Besides toasty toes, I have other reasons for clinging to my socks. I don’t have that many pairs. If I’m wearing them to a bonfire party, it’s likely that I consider them part of my sailing gear. I’m not trying to perpetuate the stereotypes of the frugal sailor or the starving writer. I can afford new socks, but I choose not to buy them often. Why? I’m not desperate yet. My feet are still warm. I have enough pairs of socks to get by—just not enough to sacrifice to the equinoctial gods for fun. I think a lot of sailors have this sort of attitude toward their gear. They hang on to it until it’s lost, destroyed, or so leaky that they suffer for one bitter day before throwing it away, if they can part with it. Imagine a sailor friend blowing out a toe in his old dinghy boot. Does he: a) immediately drive to a boat supply store to buy new boots, or b) duct-tape it? If he chooses the tape option, when it wears off, does he: a) go out and buy new boots, or b) re-duct-tape it? If this image makes you smile, then you know that it’s less about frugality and more about the challenge of surviving a boot blow-out and the joy of sporting a boot with a story. Sailing gear, even a pair of socks, has memories attached to it. That’s why it’s tough to say goodbye to it. I would love to survey sailors about the first time they wear their foul weather gear in the spring and what treasures from the previous season they find in the Velcro pockets. Among the items friends and I found last year were a ginger beer cap, lost sunglasses, a cotter pin, a hotel key, a nail file (crucial on deck in foul weather), a business card from a guy long forgotten, five beer bottle labels stuck together, and two drink tickets from the Royal Bermuda Yacht Club. Even if each item in our pockets didn’t spark a specific memory (such as the Bermuda ticket surely did), a relic like a ginger beer cap suggests a lively moment in time. After a long winter, such a memento may rekindle hope, as a budding crocus does, and reminds us that sailing season is coming. Pull enough hopeful tidbits out of any jacket pocket, and it’s a sure bet that you’ll become attached to it for its pleasant association if not for its warmth and wicking wonders. That’s why we tend to hang on to our gear until it’s over. Perhaps this is a rationalization for being too cheap to buy new gear. There’s a grain of truth in that. But there’s more to it. My attachment to my gear, including my socks, is a mix of practicality, sentimentality, and resistance to change. Besides the fact that it’s a lighthearted, home-grown tradition, what’s so charming about the Burning of the Socks, is that it’s a shunning of cold days—held on a cold day. The temperature at the spring equinox usually peaks at 48.9 degrees in my neighborhood. Not exactly flip-flop weather, but the natives strip off their socks and burn them anyway. If that doesn’t hold some loony charm for you, then you won’t like this place. As much as I enjoy the concept, I resist it. That the chill may linger for a few weeks following the equinox is okay with me. I like the winter months and their empty weekends, free for dawdling around the house or taking walks. Fresh in memory is a beautiful, bright February morning walking through the fluffy snow, so light that it whisked away with one swoop of a broom, and seeing it sparkle in the trees. I don’t need to rush forward into the next season when there’s still something to savor in this one. Do I want to go sailing? Yes. Soon. But on that symbolic date when the day is as long as the night, I’m going to hang on just a little while longer to my memories, my quiet time, and my socks. Whether we force it or not, spring will come. Winans is the Managing Editor of Annapolis based SpinSheet Sailing and PropTalk Powerboat Magazines and an avid sailor. Publishers Note: This article first appeared in the March 2007 issue of SpinSheet. We only feel it right to publish it annually since it is a ceremony dear to our sailor hearts.